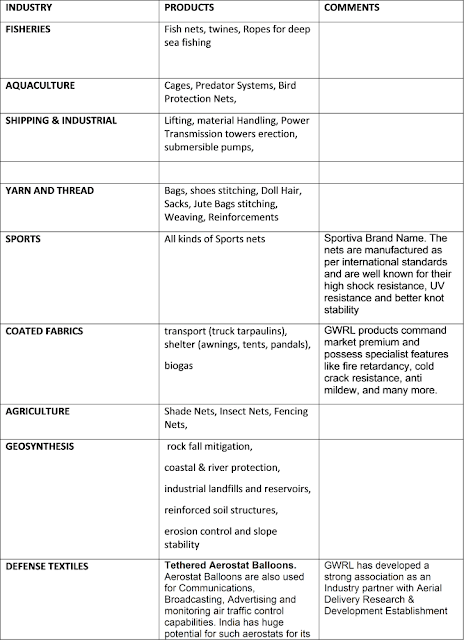 This article provides in-depth fundamental analysis of Garware Wall Ropes Ltd, an Indian manufacturer technical textiles specializing in ropes & nets focusing on fisheries, aquaculture, shipping, sports, agriculture, coated fabrics and geo-synthetics. I have been investing now for almost 5-6 years and find your blogs and articles/ e-books compilation very informational and useful. I have a specific query about Garware Wall Ropes Ltd on which I wanted your expert thoughts. I evaluated the same and it fulfills all the criteria except being a bit high on the valuations side which is not that steep too. 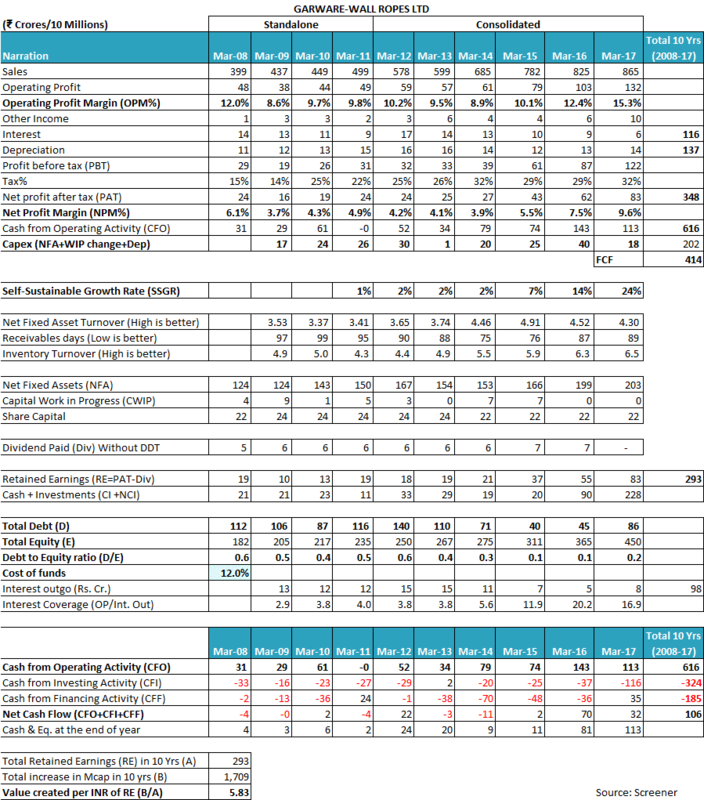 It has a good margin of safety (MoS) in terms of FCF/CFO ~ 67%, SSGR > Sales Growth, DE ratio < 0.5, Promoters check is satisfactory and healthy and consistent NPM. 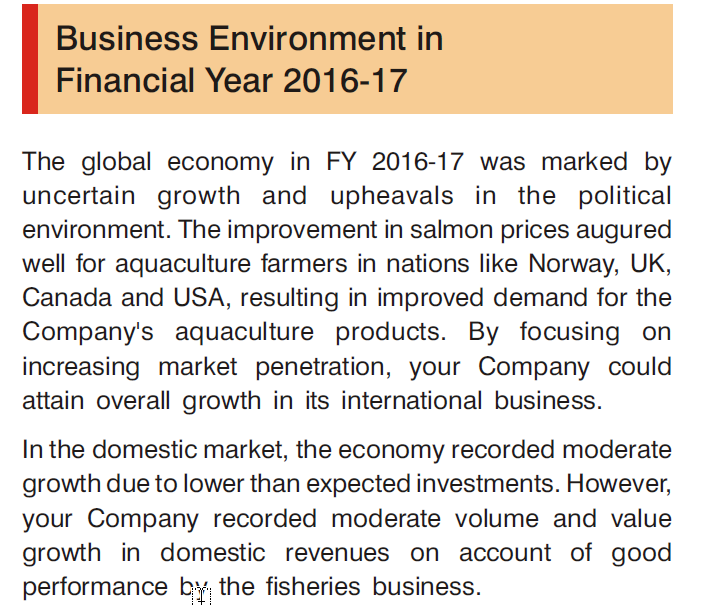 While browsing through its FY17 annual report I found one strange observation. Garware Wall Ropes Ltd has increased its short term borrowings by 45 Cr. At the same time it increases its bank balance by 32 Cr. Now they invest around 105 Cr around 120% of their FY 17 PAT in NCDs and Mutual funds, which if fine for a long term investment but why do it at the cost of Debt? 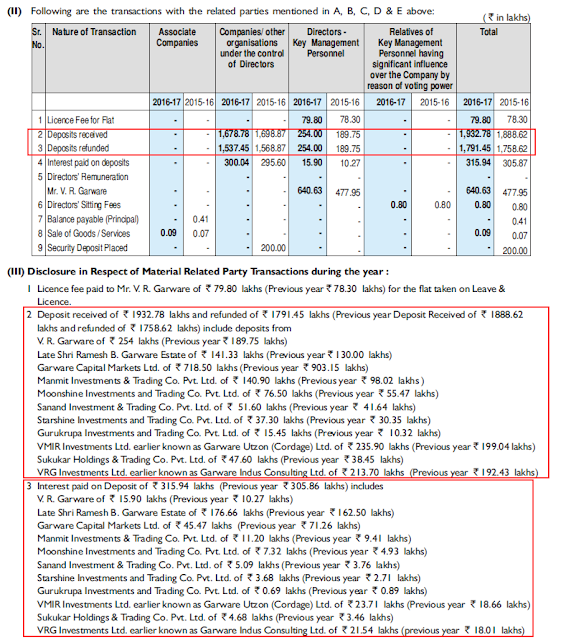 Does it means that Garware Wall Ropes Ltd is believing it is better to invest in MF and NCDs rather than in itself? Also, it has deposited money in banks worth 30 Cr. as increase in its bank balance. Why has Garware Wall Ropes Ltd not utilized the same for borrowings and borrowed at additional costs? I am attaching my analysis for reference and would be thankful if you can please advise. The company has bought worth more than 100 Cr. of NCD’s and mutual funds with their Cash. At the same time the company is increasing its short term loans from domestic and international banks to a tune of 45 Cr. It means the company is believing it is better to invest in MF and NCDS rather than in itself. Also it has deposited money in banks worth 30 Cr. as increase in its bank balance. Why has the company not utilized the same for borrowings and borrowed at additional costs. Why have they not gone for a share buyback which could benefit the minority shareholders more? Finance Cost has though came down in 2017. Basically if you have a look and try to understand in simple financial terms, the company takes a loan of 19.32 Cr and pays back 17.91 Cr. and pays an interest of 3.15 Cr. for FY17. If we calculate the rate of interest here it is 3.15/17.91 ~ 17.6% which means that company has 112 Cr. 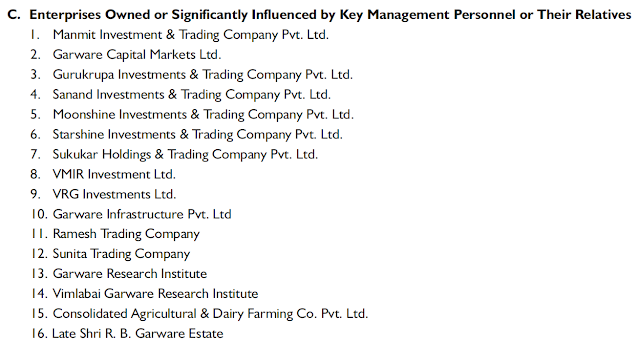 Cash in Bank still they avail loans form their own/relatives investment companies @ 18% and funnel out shareholders money out of the company to their own/relatives companies. This is not in interest of the minority shareholders. The company in fact should have used its cash or reserves from 105 Cr. invested in NCD and equities to fund the necessary requirements instead taking of a loan @ 18% from their own companies. The intention of management is GREEDY and NOT IN INTEREST OF MINORITY SHAREHOLDERS. Thus we need to avoid this company. Thanks for sharing the analysis of Garware Wall Ropes Ltd with us! We appreciate the hard work put in by you in the analysis. 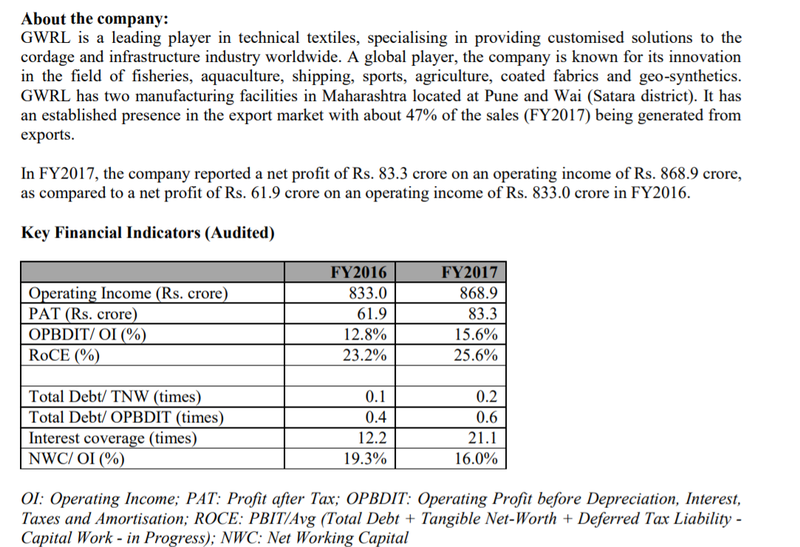 Let us first try to analyse the financial performance of Garware Wall Ropes Ltd over last 10 years. An investor would note that currently Garware Wall Ropes Ltd has one wholly owned subsidiary and one associate company. 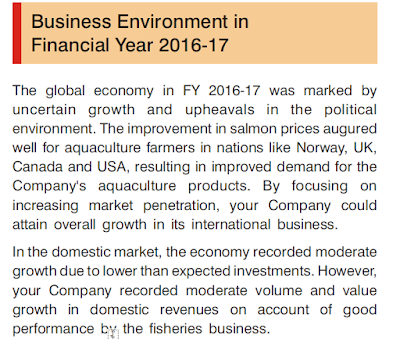 However, both the entities are yet to start their operations (FY2017 annual report: page 22). Therefore, the standalone financials present the entire current operations of Garware Wall Ropes Ltd. However, we believe that while analysing any company, the investor should always look at the company as a whole and focus on financials which represent the business picture of the entire group including operations and assets. 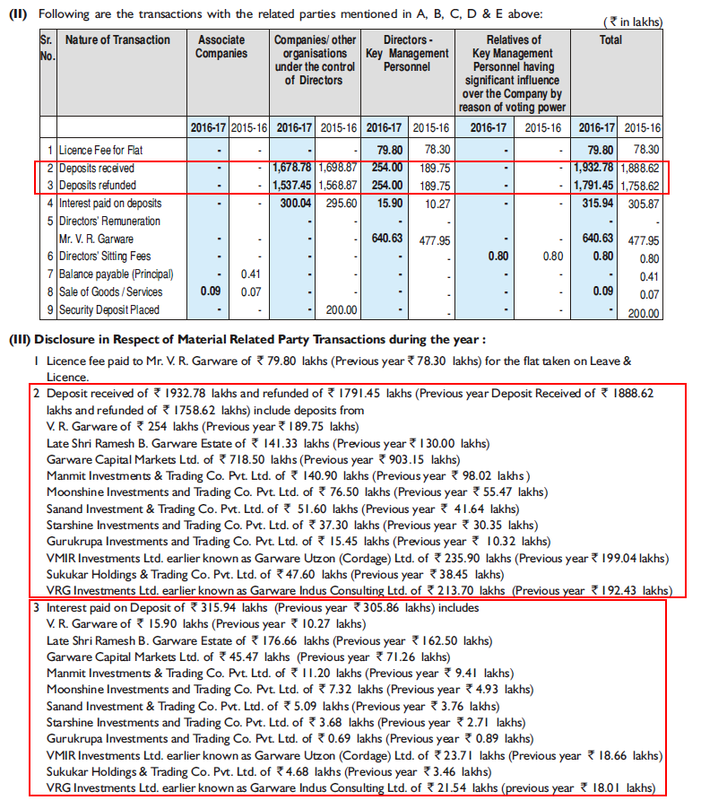 Garware Wall Ropes Ltd has been publishing only standalone financials until FY2011. However, from FY2012 onwards, it has been publishing consolidated financials as well. Therefore, while analysing Garware Wall Ropes Ltd, we have analysed standalone financials until FY2011 and the consolidated financials of the company thereafter. Garware Wall Ropes Ltd has been growing its sales since last 10 years (FY2008-17) at a rate of about 8-10% year on year from ₹399 cr. in FY2008 to ₹865 cr. in FY2017. 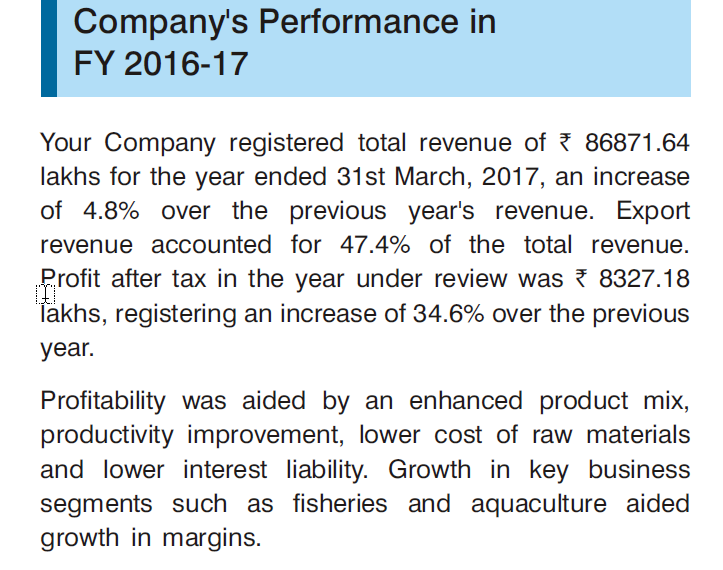 An investor would notice that the sales growth achieved by Garware Wall Ropes Ltd until FY2014 was associated with fluctuating profitability margins. The operating profit margin (OPM) was fluctuating between 8-12% during this period. The key reason was the inability of the company to pass on the raw material changes to its end consumers. However, it seems that since FY2014 onwards, the efforts of the company to establish a brand in the consumer market have paid fruit and the company is able to exercise some pricing power and hold on to the retail consumer prices despite reduction in the inputs costs, which are dependent on crude oil prices. 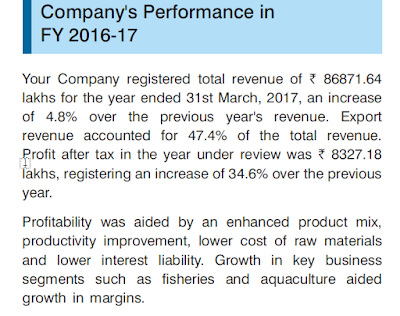 As a result, the OPM of the company has witnessed improvement from 8.9% in FY2014 to 15.3% in FY2017. Until now, the company has been able to hold on to the retail consumer prices in the times of declining raw material costs (crude oil prices), however, it remains to be seen whether the company would be able to increase prices in future when the commodity cycle turns and the crude oil prices increase again. This is essential because otherwise, the company will witness decline in profitability margins and it will again find itself entangled in the the cyclicty of operating margins. Moreover, it also remains to be seen whether the company is able to successfully execute the new initiative with Aero-T, absorb the technology and produce quality aerostats acceptable to defense forces. The net profit margin (NPM) has been following the trend of the operating profit margin (OPM). NPM was initially fluctuating between 4-6% during FY2008-14 and it has been improving in recent years from 3.9% in FY2014 to 9.6% in FY2017. 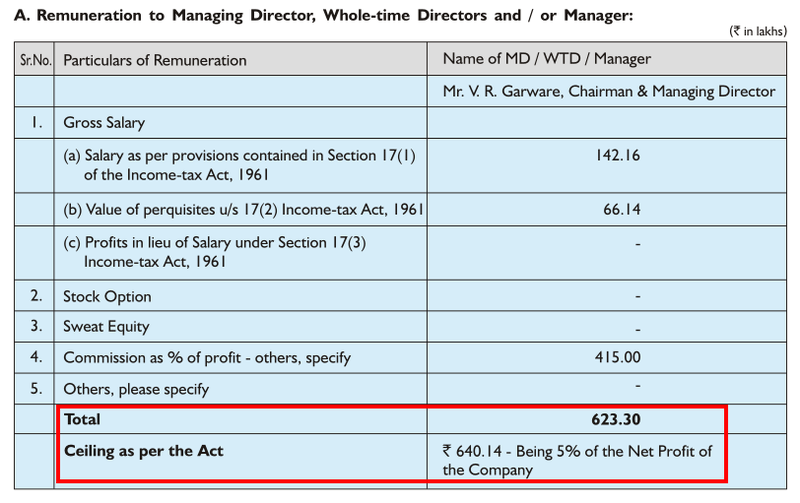 The tax payout ratio of Garware Wall Ropes Ltd had been below the standard corporate tax rate prevalent in India until FY2014. However, since then, the company has been accounting for taxes at a rate nearly equal to the standard corporate tax rate. While assessing the net fixed asset turnover (NFAT) for Garware Wall Ropes Ltd, an investor would notice that the NFAT of the company has been consistently at a healthy level of more than 3.5 throughout last 10 years. The NFAT has declined during FY2015-17 from 4.91 to 4.30. However, this reduction coincides with the capacity expenditure being done by the company during this period. An investor should keep a watch whether the NFAT of the company improves as it operates its capacity on optimal levels going ahead. An investor would notice that Garware Wall Ropes Ltd has a NFAT exceeding 4, which is a very good asset turnover for most of the businesses. Such levels of NFAT are usually seen in companies, which do not need to invest a lot in their plant and machinery or those who rely on outsourcing of the manufacturing process and in turn primarily act as trading companies. The companies, which are not into trading of goods and enjoy such high fixed assets turnover on account of low capital intensiveness of their operations face a lot of competition from unorganized sector unless their market is protected by intangible factors like brands or patents. 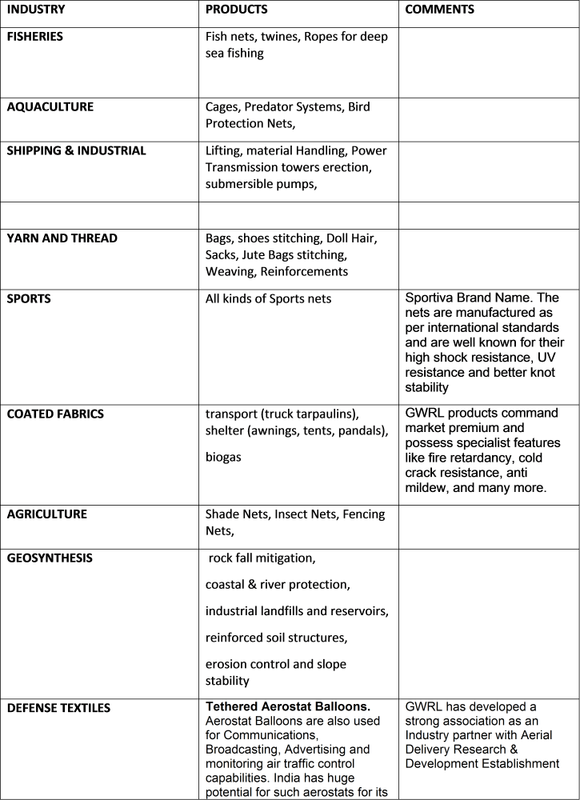 It does not come as a surprise to an investor that initially Garware Wall Ropes Ltd faced a lot of pricing pressure on its products from the unorganized sector, as discussed above. However, now the company seems to have realized that the competition from unorganized sector will always be there in this industry due to low capital intensiveness. Therefore, the company has started to focus more on creation of brand in the consumer market and on production of more value adding products, which seems to have resulted in the improving profit margins for the company in recent years. Looking at the inventory turnover ratio (ITR) of Garware Wall Ropes Ltd, an investor would notice that Garware Wall Ropes Ltd has been able to improve its inventory turnover ratio consistently since FY2011. The ITR has increased from 4.3 in FY2011 to 6.5 in FY2017. This reflects improvements in the inventory management by the company over these years. When an investor analyses the receivables days of Garware Wall Ropes Ltd, then the investor would notice that the receivables days of the company have been improving in the initial period of last 10 years, i.e. from 99 days in FY2010 to 75 days in FY2014. However, since FY2014, the receivables days have been increasing consistently and have reached 89 days in FY2017. Other reasons might be that Garware Wall Ropes Ltd might need to give higher credit period to add new customers as well as push premium priced value added products in the markets. It is advised that the investor may seek clarification from the company about increasing receivables days in recent years and also keep a close watch on the trend of receivables days going ahead. 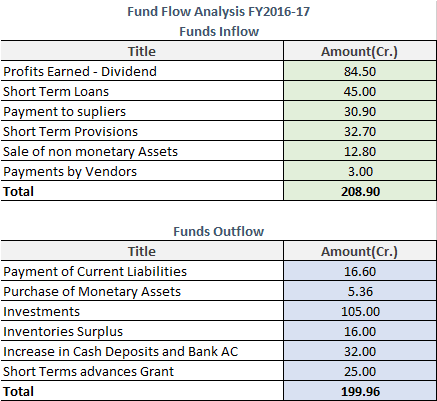 However, the delay in collection of receivables as reflected by increase in receivables does not seem to be large enough to create troubles on the cash flow/liquidity front for Garware Wall Ropes Ltd. The company has been able to report a cumulative cash flow from operations (cCFO) of ₹616 cr over last 10 years (FY2008-17) against cumulative net profit after tax (cPAT) of ₹348 cr. An investor would notice that the cCFO is remarkably higher than cPAT for Garware Wall Ropes Ltd due to depreciation and interest expenses, which are significant for last 10 years (FY2008-17). Garware Wall Ropes Ltd has had cumulative depreciation of ₹137 cr and interest expense of ₹116 cr. over FY2008-17, which is added back to cPAT to arrive at cCFO over these years. Moreover, as discussed in the section on net fixed asset turnover (NFAT) above, Garware Wall Ropes Ltd operates a business, which has low capital intensiveness and therefore, does not has a lot of cash requirements to sustain its growth. The investor would notice that Garware Wall Ropes Ltd has witnessed an SSGR ranging from 1% in FY2011 to 24% in FY2017. The key reasons for such improvement in the SSGR for the company are improvements in the NFAT and the NPM for the company over the years (the SSGR formula used by us takes 3 years rolling average of the input parameters). As of FY2017, the SSGR of Garware Wall Ropes Ltd is 24%, which is higher than the achieved sales growth of 8-10% achieved by the company over the years. As a result, it can be observed that Garware Wall Ropes Ltd has been able to reduce its debt over the years. Moreover, the investor would also notice that the company has investments of worth ₹228 cr. in FY2017 against a debt of ₹85 cr. and therefore the company has a net debt of zero at FY2017. The asset light nature of the business of Garware Wall Ropes Ltd, which is reflected in the net fixed asset turnover ratio of more than 4 over the years and thereby comparatively low requirement of cash to fund its growth is also visible when we analyse the free cash flow position of the company over last 10 years. The relative asset light business model of Garware Wall Ropes Ltd has ensured that the company needed to do a total capital expenditure of ₹202 cr. over last 10 years (FY2008-17) to increase its sales from ₹399 cr. in FY2008 to ₹865 cr. in FY2017. If an investor analyses the total cumulative financial performance of Garware Wall Ropes Ltd over last 10 years (FY2008-17), then she would notice that the company had met the entire capex of ₹202 cr. from its cumulative CFO of ₹616 cr. during the same period. As a result, after meeting entire capex, Garware Wall Ropes Ltd had a free cash flow (FCF) of ₹414 cr. 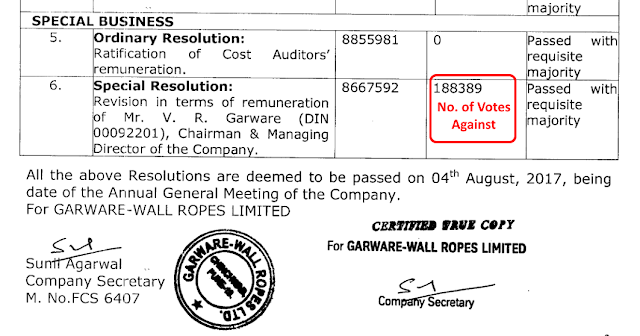 Garware Wall Ropes Ltd seems to have used the FCF of ₹414 cr. to pay the interest costs (about ₹116 cr.) and reduce debt during last 10 years (about 27 cr), pay dividends to shareholders (about ₹55 cr) and increase the cash & investments balance (about ₹228 cr.) on its books. An investor would also appreciate that in addition, Garware Wall Ropes Ltd came out with a buy back offer in 2013, where it bought back 4% shares of the company using about ₹10-11 cr. of funds. It seems that the markets have appreciated that Garware Wall Ropes Ltd has been able to demonstrate strong cash flow position along the growth path and as a result, its market capitalization has increased by about ₹1,700 cr. over last 10 years against the retained earnings of about ₹300 cr. over last 10 years. It amounts to creation of a wealth of about ₹5.8 for each ₹1 of earnings retained by the company. Also, the strong cash flow position of Garware Wall Ropes Ltd has been recognized by credit rating agency, ICRA as well and as a result, ICRA upgraded the credit rating of the company from A+ to AA- in July 2016. Presence of high cash and high debt on the books of any company is a sign of caution and demands further analysis before any final opinion is made about the company. Upon analysis of debt of Garware Wall Ropes Ltd, an investor would notice that the entire debt of ₹85 cr. is short term debt, which is primarily working capital debt. Moreover, out of the increase in debt of ₹45 cr. in FY2017, almost all of the increase (₹42 cr.) is in packing credit in foreign currency loan. a) The packing credit in foreign currency (PCFC) is a facility available solely to exporters for funding the purchase of raw material to produce the product to be exported. It is available at very cheap terms. As per SBI website, on Oct. 14, 2017, the PCFC is available at LIBOR + 2%. The current LIBOR for 1 to 3 months as per bankrate.com as of Oct. 14, 2017 ranges from 1.25% to 1.50%, which makes the estimated cost of PCFC for Garware Wall Ropes Ltd equal to 3.25% to 3.50%. As Garware Wall Ropes Ltd, has significant amount of export receivables, therefore, it enjoys a natural hedge in its cash flow and it does not need to incur additional hedging costs on PCFC. Therefore, this scenario of increase in debt along with increase in cash investments might be construed as a case where Garware Wall Ropes Ltd is funding its export products at 3.25% and investing the CFO proceeds into NCDs etc, which might give it a return of 8-10%. b) The second situation, which we believe deserves attention is that in some of the communications in the media (we are not able to locate the exact interview), the management has guided about growth via inorganic route (i.e. acquisitions). Carrying on cash on the books might be to create a war-chest for any impending acquisition transaction, if the management has identified any target company. However, both the above situations are our assumptions without contacting management. Therefore, we believe that the investors should contact the company directly before making any final opinion about the presence of high cash on the books of the company along with carrying debt of ₹85 cr. Getting clarification from the company management in this regard would become further pertinent if this situation of high cash with debt persists going forward without any disclosure by management regarding its plans for the cash accumulated. Therefore, it is recommended that investors should monitor the cash and debt levels of the company going ahead. An investor would notice that the founder promoter Mr. B. D. Garware, brought in his son Mr. R. B. Garware in the company, who took forward the company after the demise of the founder chairman. Mr. R. B. Garware brought in his son Mr. V. R. Garware and made him the CMD of the company and himself stayed as director of the company. As a result, after the demise of Mr. R. B. Garware in February 2014, the company could keep on functioning smoothly. It seems that until now, Garware Wall Ropes Ltd has witnessed good succession planning. However, it remains to be seen how the succession planning goes on in future. It should be one of the key parameters, which should be assessed by the investor, while making investment decision in the company. The increase in shareholding of promoters by not tendering their shares in the buyback reflects confidence of the promoters in the company’s business on the similar lines like that of market purchase of shares of the company by promoters. To clarify, this is not to state that when promoters who submit/tender their shares in the buybacks, it is a bad sign. The recent changes in the taxation on dividends, where entities/persons receiving large amount of dividends (>₹10 lac), have to pay additional tax, has made dividends as a non-preferred way of distribution of cash by companies to shareholders. As a result, more and more companies now prefer buybacks over dividends to distribute cash to shareholders. In buybacks, the receipt of money by shareholders from the company is taxed as capital gains, which has now become more tax efficient than dividends. Therefore, we believe that when promoters submit proportionate number of shares like everyone else, then the buyback transaction effectively becomes equal to dividend distribution. However, when promoters do not tender/submit their shares in buybacks, then post-buyback, their shareholding in the company increases and we interpret it in the same manner like market purchase of shares by promoters, which shows confidence in the company and its business. a) The promoter/CMD Mr. V. R. Garware drew a remuneration of ₹6.23 cr. in FY2017, which is almost equal to the maximum possible remuneration allowed by companies act, 2013 (₹6.40 cr. for Gareware-Wall Ropes Ltd). (Annual report FY2017, page: 36). b) The investor would also notice that the commission taken by the promoter (₹4.15 cr.) is almost 5% of the PAT (₹85 cr.). A commission of about 5% of PAT is high when we compare it with the commissions taken by many other promoters of different companies. We find that many other promoters normally take a commission equal to 2% of PAT. d) An investor would also note that the proposed remuneration clause does not has any fixed percentage of commission to be paid to the promoter. Therefore, effectively, if the board wants, then it can decide to give as much commission to the promoter as it wants until the total remuneration is within the new proposed higher limit of 10% of net profits as per Companies Act 2013. Such liberty to pay any level of commission to promoter would not have been there, if the commission percentage to be paid to promoter is fixed in the clause to be approved by shareholders. However, there have been many cases where the release of subsidy from Govt departments have witnessed delays and which has led to delay in realization of cash flows and resultant pressure on the working capital of the companies. Going ahead, it is advised that an investor keep a track of the contribution of the protective farming segment in the overall revenue profile of the company and the level of receivables days. In FY2017, the trade payables of Garware Wall Ropes Ltd have witnessed a sudden increase from ₹160 cr. at March 31, 2016 to ₹191 cr. at March 31, 2017. We believe that this increase in payables should be seen in the same light as the discussion of high cash with debt on the books of Garware Wall Ropes Ltd. This is because increase in trade payable is effectively the suppliers/vendors funding the cash position of the company. Therefore, an investor should keep a close watch on the cash, debt and trade payables position of the company going ahead to monitor the utilization of the cash accumulated by the company. The annual report does not provide any details about the exact nature of these provisions. We suggest that investors may contact the company to understand more about these provisions. In FY2017, Garware Wall Ropes Ltd has reported processing and testing charges of about ₹76 cr. Though the processing and testing charges are about the same level as previous year (₹70 cr. ), still as it is a very significant part of overall expenses (about 9% of sales), therefore, we believe that an investor should understand further about these charges either from the company directly or from any industry contacts, if she is able to find one. Even though, the amount of deposits and the interest thereon seem insignificant when compared to the overall net worth of Garware Wall Ropes Ltd of about ₹450 cr., however, the nature of these transactions raise a curiosity. It is advised that an investor may seek clarifications from the company about the reasons for entering such small sized transactions with so many related entities, which have the impact of increasing the compliance and reporting burden on the company. Currently (Oct. 14, 2017), Garware Wall Ropes Ltd is available at a price to earnings (P/E) ratio of about 22 based on trailing 12 months earnings, which does not offer any margin of safety in the purchase price as described by Benjamin Graham in his book The Intelligent Investor. Overall, Garware Wall Ropes Ltd seems to be a company, which has been facing tough competition from unorganized sector until a few years back, which has kept it under a lot of pricing pressure. However, since last few years, its efforts for creating a brand in consumer market has borne fruits and it is able to command a premium pricing over competitors as well as is able to hold retail prices despite reduction in the raw material prices. This along with the continued focus of the company on the newer value added product segments has led to the increasing sales growth of the company, which is associated with improving profitability. It remains to be seen whether Garware Wall Ropes Ltd would be increase its retail prices to maintain profitability when commodity cycle turns and raw material prices increase in future. Garware Wall Ropes Ltd has a comparatively asset light business characterized by relatively high asset turnover. It has led the company to report healthy free cash flows despite increasing receivables days in recent years. The company has utilized the free cash flow to fund capex, reduce debt, pay dividends, conduct buybacks etc. and it is carrying the balance funds as cash & investments. This strong cash position seems to be recognized as credit strength by the rating agency, which has led to credit rating upgrade from A+ to AA- in 2016. There are certain queries related to debt of ₹85 cr. on the books of the company despite presence of significant cash & investments of ₹228 cr. An investor should closely monitor the cash and debt position of the company going ahead to track the utilization of the cash. Until now, Garware Wall Ropes Ltd has demonstrated good management succession planning and the confidence by the promoters in the company’s business, which was reflected by the promoters not participating in the buyback offered by the company in the past. However, the current high remuneration of the promoter along with the enabling clauses approved by recent AGM, where the proposal of even higher remuneration was approved by shareholders deserves attention of investors. There are certain other aspects, which might require investors to take further clarifications from the company like increase in trade payables, related party transactions etc. These are our views about Garware Wall Ropes Ltd. However, investors should do their own analysis before taking any investment related decision about Garware Wall Ropes Ltd.